BOCAUE, BULACAN – Barangay Ginebra needed just an extra day to accomplish what it had waited a year to reclaim. Derailed after losing Game Six, the Gin Kings finished off Meralco, 101-96, in Game Seven of their finals rematch on Friday night to complete a successful title defense of the PBA Governors’ Cup. Confetti popped from the sidelines and onto the hardwood of the packed Philippine Arena where a new league record of 54,086 fans witnessed the coronation of the Gin Kings, who established an early lead before holding off a Bolts side that showed its version of never-say-die spirit down the stretch. LA Tenorio, the smallest man on the court, stood tallest in the final game of the season by leading the Gin Kings’ offensive attack and hitting the crucial free throw that sealed the deal. Scottie Thompson, Greg Slaughter, Japeth Aguilar, and Joe Devance all provided Justin Brownlee with sufficient support as the Gin Kings dealt the Bolts another heartbreak and a bridesmaid finish. 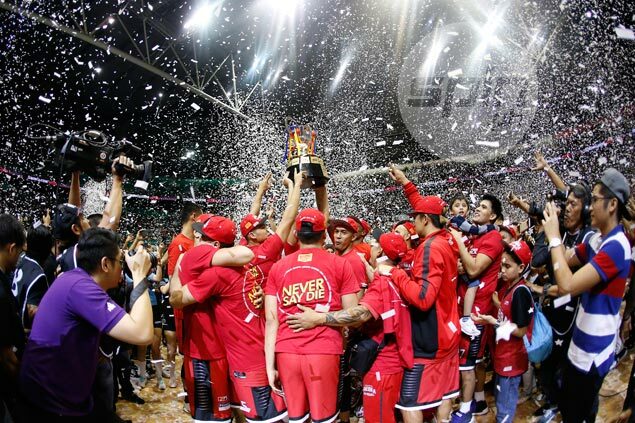 By winning the best-of-seven series at 4-3, the Gin Kings grabbed their 10th title overall to move to solo fifth spot in the all-time list of champion teams. “They just kept hanging on and we just kept answering with big shots down the stretch,” said Gin Kings coach Tim Cone, who cemented his status as the league’s most successful coach by winning his 20th title. Tenorio typified the Gin Kings’ tunnel vision as he set the tone for the Gin Kings’ early surge and finished with 26 points, four assists, one board, and one steal in almost 42 minutes to be named the PBA Press Corps-Cignal Finals MVP. The 5-foot-8 Tenorio scored his final point on a charity that ended a 7-0 run by the Bolts, who just fell short in coming back from 20 points down, 52-32, late in the first half. Brownlee didn’t need to deliver a late heroic performance this time as the prolific import provided a basket when the Gin Kings needed one, tallying 23 points, eight boards, five assists, three blocks, and one steal with less than three minutes of rest. Thompson added 14 points and missed a double-double by just one rebound, completing his all-around performance with five steals, and two assists in nearly 37 minutes, while Slaughter chipped in 12 points, five rebounds, two assists, and two blocks off the bench to win his first championship in the pros. Devance kept the Gin Kings’ ship steady as he contributed 10 points, seven caroms, four assists, and one steal, while Aguilar added 10 points five assists, three boards, and three blocks. Allen Durham led the Bolts again with another monster double-double of 26 points and 24 rebounds, missing a triple-double by just one assist, but missed a handful of point-blank shots that he usually makes that proved to be an ominous sign for his team. Jared Dillinger played his best game of the series with 20 points on five triples, and five assists, but it went for naught as the Bolts saw their campaign end like it did last season – by falling short.